Listing the museum or any club is not a big deal. It's just a way for Carlisle to identify who has the largest club in attendance. And I believe the club with the largest attendance gets recognition at the event and the club gets a trophy. But there's no "special parking" or anything else that goes along with it unless the club itself reserves space. If the museum was recognized as a "club" it would take away from the true clubs who enjoy attending and vying for that recognition year after year. Let's face it, nearly EVERYONE belongs to the museum. Just walk through and look at the windshields with the decals on year after year! Including me! If listing the museum or any club is not a big deal, then as part of the drop down menu they should have the category of "other" and let you write in your affiliation. That would solve the problem for those of us not associated with a local club. And no, not everyone belongs to the museum. And I really don't think there is a risk of Carlisle giving the NCM a trophy for the largest club in attendance -- it would be easy for them to simply exclude the NCM (or any other "write in") from the attendance trophy competition. That would solve the problem and make everyone happy including me. I don't belong to ANY club either. But it sure doesn't bother me if I don't have a "box" to click when I register for Carlisle. Guess we'll just have to leave it up to Carlisle to decide. Hi guys, I'll be coming back for just my second ever Carlisle, but I loved it and can't wait! Curious what the best registration scenario is: last year I did the $75 Fun Field and brought a friend, this year I'm bring a few friends each with our own car. Is there Fun Field still the best option? We'll be staying Friday morning to Sunday morning (might leave in the morning and not visit the show Sunday). Basically looking for how much parking inside the event costs if we just showed up and paid admission each day. Thanks, and look forward to seeing everyone there! Up on the hill Sunday morning before leaving. For me, the fun field is always the best option because I don't have to drive or walk the hill. Drawbacks are that you need to be there early to find spots together. By early, I mean before 8 a.m. and you're not guaranteed the same spots each day. So you would be looking for spots every day. We started doing the reserved parking because I don't have to worry about my stuff being moved or removed from day to day. That's MY spot, and nobody can park there except me. Consider your budget as well. There is a 10% discount (I think) still for the fun field, and if not, I read in one of the programs that there's a $5 discount if you attended any show in 2017. I have no idea how you go about just parking on Corvette only parking, but not the fun field. It's been 14 years since I did that. Hopefully Lance will chime in here with that info. It really just depends on what you and your buddies want. The goody bags aren't any big deal any more, but you do get a dash plaque and t shirt, so that's still cool. And your car on the fun field is eligible for a celebrity pick on Saturday. And you don't have to have a brand new, or rare car to be picked. I've seen barn finds get picked, and super ridiculous modded ones too. Plus fun field is closest to where the midway is, the food vendors, and the swap meet. If you bring a pop up canopy and chairs, it's a lot less walking to get there when you're tired too, and if it's super hot (like it normally is, last year was a fluke) it's always good to have somewhere to rest and cool off. I'd discuss it with your buddies, and if you can't get your answer here, give Carlisle events a call. They're friendly and will answer your questions. Financially I'm pretty sure it's cheaper to do the Fun Field. I haven't priced it out recently, but even if it was a couple of bucks more, you're going to have much better parking and a better place to "hang out" when not walking around. If you have a passenger and/or you'll be there for more than one day, my advice would be to go with the Fun Field. Been going since 1989 and again in 2018! Will be with Eastern Shore Corvette Club. We're staying at the Days Inn Carlisle North -- made the reservations a couple of months ago. Not sure if they have any rooms left. You need to maks your reservations earlier -- Hotels fill up quick for this. Days Inn Carlisle South has rooms. They run around $179 a night. The Super 8 Carlisle South (right across the street) also has rooms. Both are about a 5 minute drive from the fairgrounds. And the Days Inn has free breakfast, not sure about the Super 8. Check www.wyndhamhotels.com or check www.choicehotels.com . We're at the Country Inn and Suites just down the road from both of those. I also have a room reserved in Shippensburg in case my finances don't hold up to cover the pricier Country Inn. Last edited by USA1 427; 02-18-2018 at 10:04 PM. I have friends in that club. Barb and Bill . 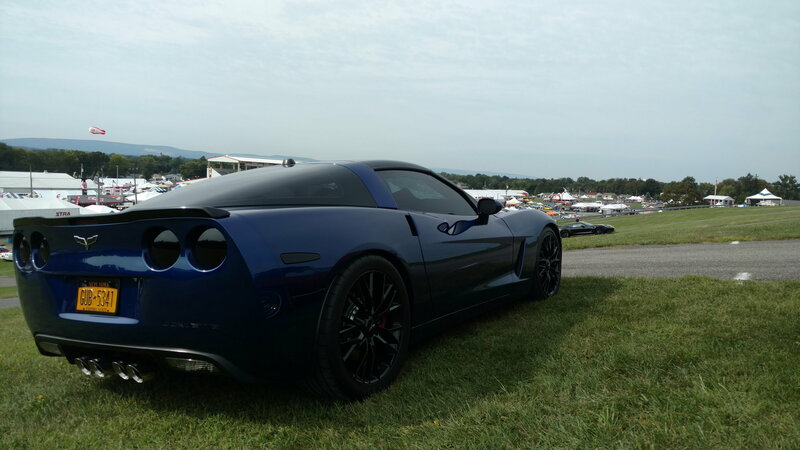 They have a C5 Z06 and a C6 ZR1. Tell them "Rich with the anniversary 427" said hi. Our group stays at the Clarion in New Cumberland every year. My wife and I have been going for the last 6 years with our 96 CE. Two weeks after the show last year we bought a 12 GS so this year will be our first year with our new car. We also get a great Carlisle discount for having a Carlisle Blue car (Thanks Lance). Our club is the Original Garden State Corvette Club and we are always up at the top of the hill. Last edited by BigT2; 03-12-2018 at 04:04 PM. Now that will make for an amazing event for you, certainly memorable! • Admission for two people for the action packed weekend (est. value: $160). • Parking spot on the Fun Field with easy in/out access (est. value: $30). Corvette Only Parking is available on a first come/first serve basis and does fill up quickly. Meaning you could have to park outside of the fairgrounds at various other parking lots around the area. Not an issue if you arrive prior to 9am or so. - fee is $10/per Corvette per day. You can purchase your entry tickets directly online by clicking here. -$20/day per person day of show discounted by purchasing earlier. You can park off grounds in whatever vehicle you'd like to bring and purchase daily entry tickets for the entire crew. Parking fees vary off-site from free to $15/day. Hope this helps! Again, my apologies for not answering this earlier. I'm ready for my 11 straight year !